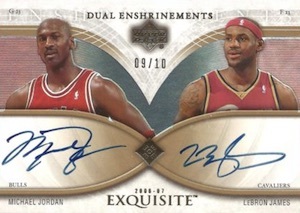 Michael Jordan and LeBron James. As two of the best players the world has seen, it is hard for a basketball discussion about one to not inevitably include the other. 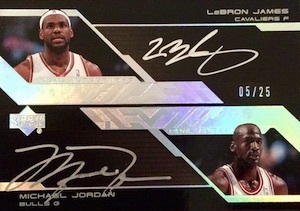 Michael Jordan stills holds the top spot in the hobby, but LeBron James is slowly chipping away. 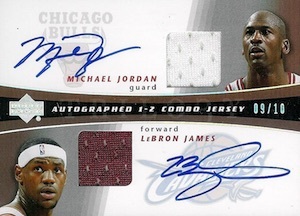 Although their respective careers just missed out on overlapping, collectors can still celebrate two of the all-time greats with a plethora of dual autographs for Michael Jordan and LeBron James. 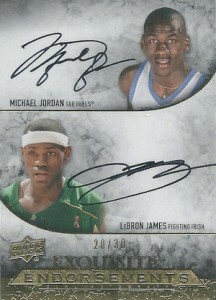 Shop for Michael Jordan, LeBron James dual autograph cards on eBay. When LeBron James entered the league in 2003, Michael Jordan had just retired for the final time. 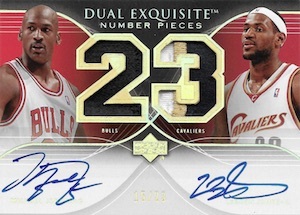 While this was disappointing for fans of MJ, for collectors, this marked a big moment and the hobby has been treated to a relatively large quantity of dual-signed cards for the two superstars ever since. Although the cards are individually rare, in total, they can be found in decent supply. However, this has not really diminished value or interest. 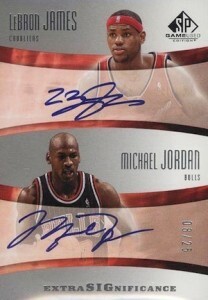 Most of the NBA editions (2003-04 to 2009-10) cannot be found for less than $1,000 and can go for much more. 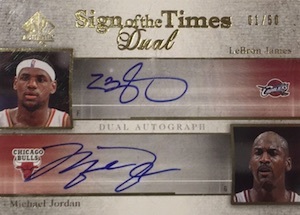 Even the college themed autographs for MJ and LBJ sell for $600 and up. As is the case for most cards, on-card trumps sticker autographs and there is a premium for game-used relic pieces and low-numbered cards. 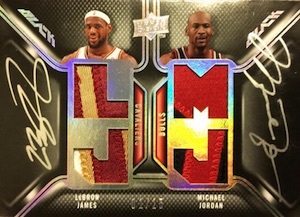 Since both are UD exclusives, Upper Deck products are still the only place to find autographed cards for Michael Jordan and LeBron James. 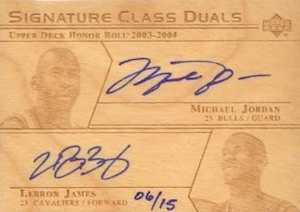 At this point, the future is not clear regarding more dual signature cards from the two global icons. 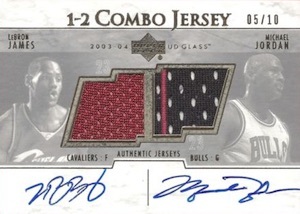 It was announced early in 2015 that Panini had obtained the exclusive CLC license. 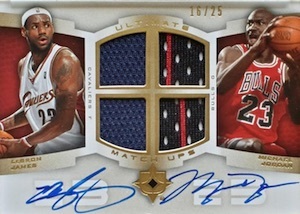 Since they already hold the NBA license as well, it remains to be seen how Upper Deck will issue basketball products in the future. 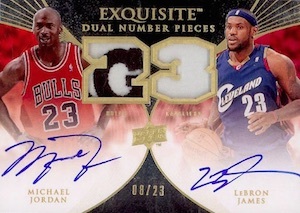 The guide below highlights 23 of the best options among cards that bare the signatures for both Michael Jordan and LeBron James. 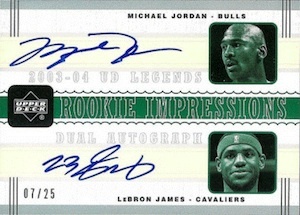 While it is by no means a definitive list, the focus is on hard-signed cards from throughout the time that LeBron James has been in the league. 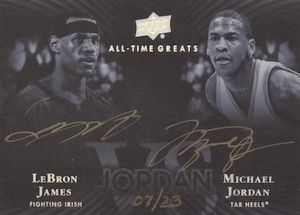 The reality is that any authentic card signed by Michael Jordan and LeBron James is a very popular collectible that will always hold strong values. 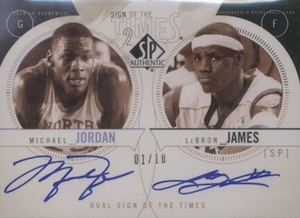 Hi im trying to price a card i cant find anywhere its a 2005 Upper Deck SP Game Used SIGnificance on card dual autograph by Michael Jordan and Lebron James #18/25 is there any set price that its worth and do i have to grade the card for it to be at full value sell?? Ty i look forward to ur answer! !